Oakland paramedic and firefighter Brian Fukuhara isn’t fond of heights, but it didn’t stop him from rappelling down the side of a high-rise building Thursday morning to rescue two window washers trapped some 200 feet above downtown Oakland. “I’m a little afraid of heights,” Fukuhara said. The two window washers, whose names and the company they work for were not available, had been stranded outside the 19th floor of the high rise at 1111 Broadway for nearly two hours before employees inside realized they were in trouble and called for help about 10:45 a.m. The two men, who weren’t available for interview after the rescue, thought they could get their platform to work again, but one of the motors was broken and getting it to move up or down was impossible, officials said. 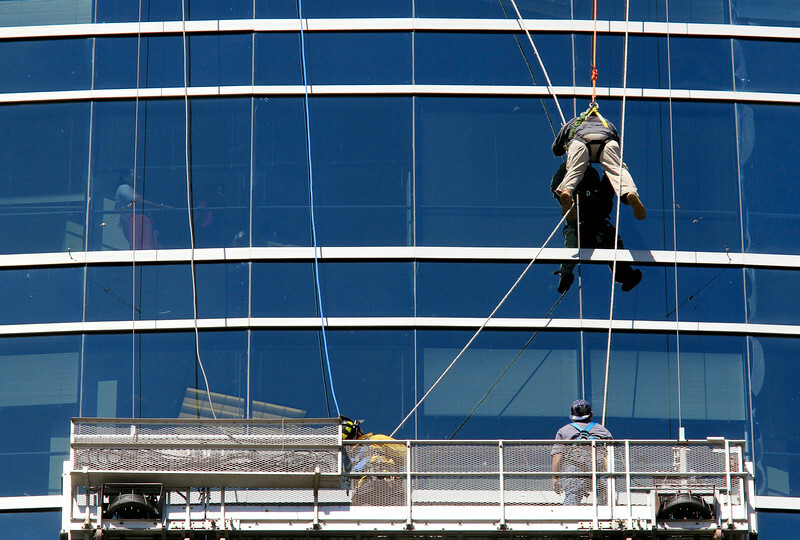 The window washers were on the Broadway side of the 24-story building, getting baked by Thursday’s warm temperatures. Luckily there were no strong winds. While firefighters were securing equipment on the roof, Fukuhara, who joked that he “half volunteered and half I was assigned,” put on a harness and began rappelling down about 11:15 a.m. for what firefighters call a high-angle rescue. He said the two men were in good spirits but a little dehydrated when he reached them, about 50 feet below the roof. They were very calm, and one of them who had been washing windows at the building for more than six years was “clearly was comfortable with heights,” Fukuhara said. Both men had extra harnesses placed on them. One was hoisted to the roof at about 11:30 a.m. and the other about five minutes later, to the applause and cheers of hundreds gathered in the street below. Fukuhara was pulled back up to the roof by 11:50 a.m. The department’s Urban Search and Rescue team trains to make sure such operations are carried out safely and in a timely manner, said Fukuhara, who has four years with the Oakland department and five years of experience with other agencies. “It feels good. We’re here to do a job safe and fast,” he added. 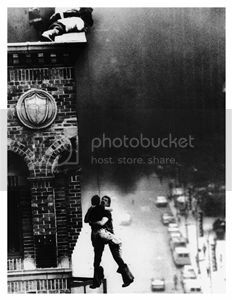 Broadway was closed in both direction between 11th and 12th streets during the rescue. The front entrance to the building was also closed but could be accessed through side and rear doors.